This event is co-sponsored with the UW-Eau Claire Forum Series. Building on his award-winning nonfiction book, Bunk, Kevin Young outlines the history of the hoax and the hoaxing of history that led us to this particular moment of “fake news” and “truthiness.” Young traces an American inheritance of fakery from P. T. Barnum to present-day impostors, like Rachel Dolezal, who reaffirm the hoax as rife with race and unreason, threatening our art, politics, and daily lives. *Tickets can be purchased in person at the University of Wisconsin–Eau Claire W.R. Davies Student Center Service Center as well as online by clicking below. KEVIN YOUNG is the Director of the Schomburg Center for Research in Black Culture and Poetry Editor of the New Yorker. He is the author of twelve books of poetry and prose, several of which have won awards or have been finalists for the National Book Award. 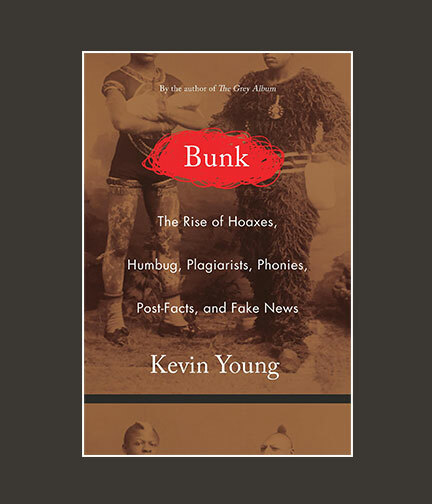 His nonfiction book Bunk: The Rise of Hoaxes, Humbug, Plagiarists, Phonies, Post-Facts, and Fake News (Nov 2017, Graywolf Press) has garnered numerous accolades, including a “Best Book of 2017” by NPR, the Los Angeles Times, and Dallas Morning News.